In Accuracy & Continuity the course content focuses on illustrating the steps necessary to comply with due diligence standards. The tax preparer must not only explore accuracy on a current year return, but review of a prior year return for figures related to carryovers and depreciation should also be performed. In addition, the course content touches on situations that involve interest and dividend income, RMDs, rental income, and short-and long-term capital gains. Finally, the course provides a brief discussion of basis determination and preparer contingency fees. 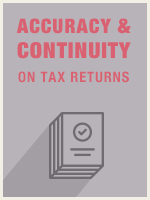 Review prior year's return for accuracy, comparison, and carryovers for current year return. Recognize items that will affect future returns (e.g., carryovers, depreciation). Interest Income (taxable and non-taxable) (e.g., Schedule B and 1099-INT). Dividend Income (e.g., Schedule B and 1099-DIV). Rental income and expenses (e.g., Schedule E Supplemental Income and Loss). Required minimum distributions from retirement plans. Short-term and long-term capital gains and losses (e.g., Schedule D Capital Gains and Losses, Form 1099-B Proceeds From Broker and Barter Exchange Transactions). Determination of basis of assets (e.g., purchased, gifted, or inherited). Rules regarding fees, including contingent fees.